The gravitational pull of thousands of small space rocks, rather than a massive, unseen planet, could be creating the odd orbits of objects in the Kuiper Belt. DENVER — Small but rowdy space rocks pushing and jostling one another may have created the unusual orbits some astronomers cite as the signature of the hypothesized "Planet Nine," a new study suggests. To date, researchers have discovered more than 2,300 bodies in the cold, distant realm beyond Neptune's orbit. The huge number of these trans-Neptunian objects (TNOs) makes it computationally intensive to model the evolution of their orbits. However, the new study suggests that the complex gravitational dances among TNOs can be enough to send some, such as the dwarf planet Sedna, onto odd and intriguing paths. Madigan and CU Boulder undergraduate student Jacob Fleisig presented the results here at the 232nd meeting of the American Astronomical Society, in Denver. The Kuiper Belt, the region immediately beyond Neptune, harbors TNOs of many sizes. The largest is Pluto, which was discovered more than 60 years before any of the others. Some TNOs are "detached objects," which orbit so far from the sun that they're not appreciably affected by the gravity of Neptune or any other known planet. Perhaps the most famous of these is Sedna, which takes 11,400 years to make a single orbit and never comes closer to the sun than 20 times farther out than Pluto. In 2016, astronomers Konstantin Batygin and Mike Brown announced that a distant undiscovered planet could have created the unusual signatures of some TNO orbits in the Kuiper Belt and sent Sedna and other detached objects out to even more distant realms. Batygin and Brown calculated that this world, dubbed Planet Nine, may be 10 times more massive than Earth and orbit the sun about 20 times farther away than Neptune does. But not everybody is on board with the Planet Nine hypothesis. The skeptics include Madigan and Fleisig, who, along with study co-author Alexander Zderic, a UC Boulder graduate student, think they've found an alternate solution to the weird orbital signatures. According to the researchers' simulations, the TNOs move like hands on a clock, with the most massive objects moving slowly, like the hour hand, and the smaller ones ticking along quickly, like the minute hand. The result is that the smaller bodies pile up quickly — and their accumulated gravity is strong enough to reshape the paths of larger TNOs that get close. Eventually, the larger chunks wind up in extreme orbits, just like Sedna. "The crucial difference is to include their mass in the simulation," Madigan told Space.com. The researchers didn't add mass to all of the TNOs, only to about 400. But that was enough to send the most massive objects into bizarre orbits. The collective-gravity hypothesis isn't a silver bullet, however. For example, there's still "clustering in pomega," which Madigan described as the odd fact that the orbits of the detached objects all tilt the same way. "Planet Nine explains this really well, and we do not," Madigan said. Ironically, while the new research discounts the need for an undiscovered planet, it requires the presence of thousands of smaller unseen objects. "The handful we've seen is not enough," Fleisig said. Madigan told Space.com that the early solar system was filled with enough debris to build up tens of Earths, but in far smaller pieces. Because most of the objects are modeled massless, most studies eject the bulk from the solar system. Adding mass means that more of that material could have stuck around, their smaller size keeping them from being detected. "The objects we've seen so far are just the tip of the iceberg," Fleisig said. While the small size of most TNOs makes them a challenge to detect, their motion makes it even harder. Usually, the larger an object is, the easier it is to discover. But because the largest objects are hurled into the most eccentric orbits, they become more difficult to find, the researchers said. In addition, the presence of the small handful already spotted suggests a larger population, Madigan said. "If there are only 10 out there, and we detected 10, it's bizarrely lucky," she said. The gravitational interactions among TNOs may also explain another strange event: the extinction of the nonavian dinosaurs about 65 million years ago. Madigan called this impact-extinction-cycle idea "geology's Planet Nine" — a nebulous connection she said is under debate in geologic circles. 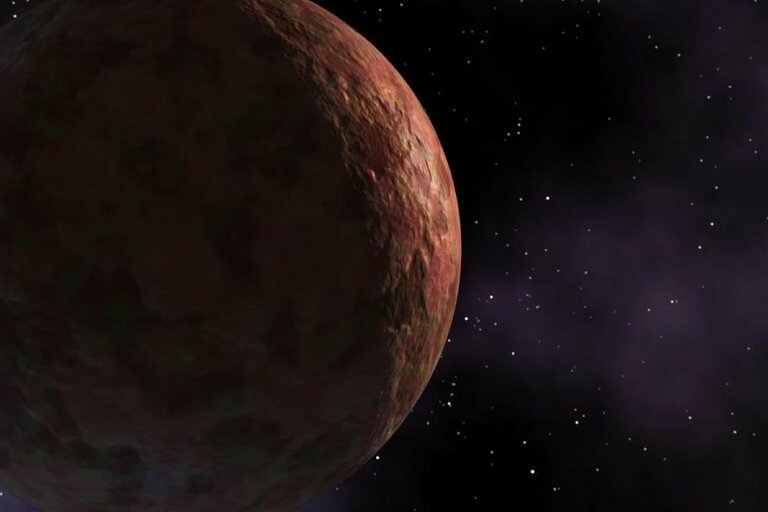 If the small gravitational interactions among TNOs are hurling objects like Sedna outward, they could also send some of the rocks into the inner solar system. Fleisig said the team's model creates periodic comet showers for the rocky planets, including Earth. While the researchers couldn't directly connect their observations to the collision that wiped out the dinosaurs and most life on Earth, Fleisig called the possibility "tantalizing." "It's exciting and suggestive," Madigan said.